HOUSTON (ICIS)--US butyl acetate (butac) supply will continue to stay balanced with demand for the near term, then stretch into some oversupply later in the first half of 2018. Upstream, there was only a moderate gain in November feedstock propylene. But feedstock acetic acid has been pressured by supply constraints in the wake of Eastman’s explosion at its plant in Kingsport, Tennessee on 4 October. Normal operations are expected to resume early next year. Barring unplanned operational outages, supply is expected to remain mostly steady-to-long through the first half of 2018, which will encompass the US spring paint and coatings season in the second quarter. Some supply pressure, however, is likely from pent-up demand for paint and coatings after Harvey, storm damage in Florida and other southeastern states from Hurricane Irma, and current and recent wildfires in California. Each is expected to heighten coatings and construction demand early in 2018. Although demand softened in December, buying interest will remain strong well into 2018 on continued storm-recovery efforts. While many renovations have begun, repainting is likely to see a strong surge in the first half of the year, which encompasses the spring paint and coatings season. Transportation issues also will keep pressure on supply. Although compromised logistics in the US Gulf region have returned to pre-Harvey levels, problems still exist. “Suppliers are still requesting lead times of 7-10 days versus one to three days in the best of times,” another buyer said. 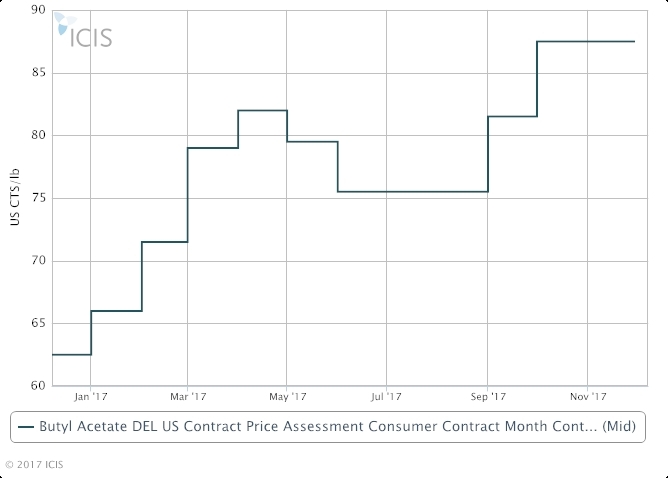 November butac free-market contract values were last assessed flat by ICIS in a range of 86-89 cents/lb DEL (delivered). Butac's major use, accounting for about 75% of total demand, is in the manufacture of various paints and coatings for the furniture, construction and automotive sectors. Among other uses, it is also used as a solvent in the chemical and pharmaceutical industries. Major US butac suppliers include DowDuPont, Eastman Chemical and Oxea.